Istanbul: Apart from being the capital of Turkey, Istanbul is so far the largest city in the whole republic of Turkey, and among those big cities in Europe and the world at large. Another baffling thing about this city is that it is the only city in the whole world that stretches between two continents hence connecting them. It has many shopping options; the Grand Bazaar is the most famous shopping destination. 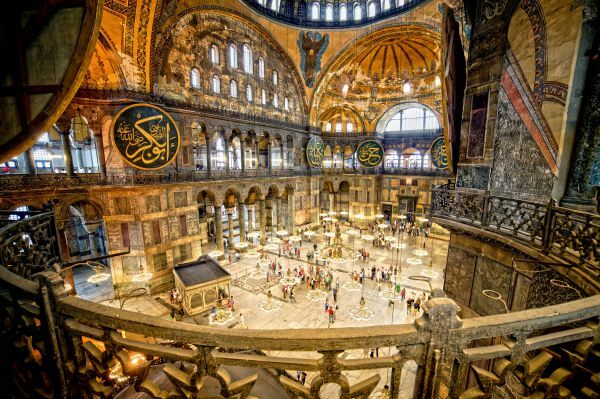 The most beautiful Blue Mosque and Hagia Sophia are the monuments to look for. Antalya: In the coastal beach of the Mediterranean Sea, lies this beautiful town in the shows of Turkish Rivera. With its vibrant restaurants, resorts and bars, Antalya, fascinates even the natives who many a times find it amusing to walk in the Riverian coast. There are a lot of activities for every family member, from sightseeing to mountain climbing. Ephesus: Can anyone talk of Turkey without a mention of Ephesus? Hardly will you. Since the 1st century CE, this city has stood to be a big tourist attraction in the whole of Turkey. The ancient Goddess of Artemis has a magnificent temple planted in this town. You cannot get out of Turkey without visiting its biggest Celsus Library. Marmaris: This is the most visited seaside resort. Located in the Southwestern region of Turkey, Marmaris’ cruises dock at the port that serves the environs with all goods that are brought and of course exported. While at Marmaris, you will enjoy water sporting among others. Side:Side sits in the ancient town of Pamphylia that is believed to be the residence of Alexander the Great. Since the 4th century BC, a lot has changed in this peninsula town of Side. The ruins of the Colossal Amphitheater are a few of the fascinations of the town. Bodrum: Situated in the Southern part of the Aegean Sea, Bodrum is believed to be the home of Mausoleum, included in list of the world’s Seven Wonders. It is in this Aegean coastal town that sits the famous St. Peter’s Castle. This is a must watch when in Turkey. Cappadocia: Cappadocia is in central Anatolia .Ancient volcanic activities that are now termed as extinct, is a talk of the town with debris standing as evidence. The landscape of this town is breath taking coupled with the chimney looking formations and many spectacular features that will keep you coming back. Turkey has always been a fascination for many travelers; it has a blend of both the modern and historical culture. Get your Turkey Visa and explore every nook and corner this culturally rich country.